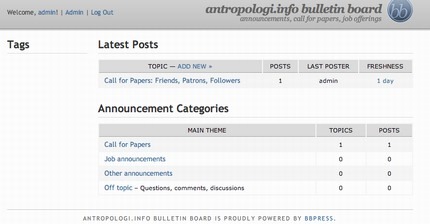 I have installed a new bulletin board for job announcements and call for papers. Announcements are now easier accessible. Until now, I’ve posted announcements in one of the forums. Apart from the German forum, the forums haven’t been a huge success, so I am considering closing them and concentrate on announcements instead (I often receive emails where I am asked to put announcements on the antropologi.info website). 2) register (takes 10 seconds) and do it yourself. So take a look at the new announcement site and tell me if it looks okay. I’ll integrate the bulletin board into the site afterwards.